2 oz. 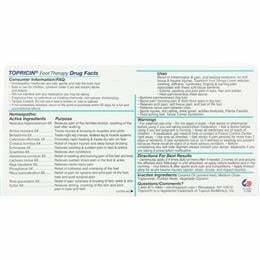 tube Topricin® Foot Pain Relief Cream is a soothing combination of 14 biomedicines that is a safe, natural alternative to chemical-based lotions and ointments. 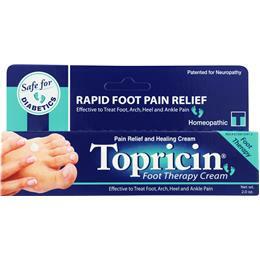 Made to penetrate the skin of the feet this is much like a moisturizer, fast absorbing and formulated for treating the pains associated with Neuropathy (Diabetic & Chemo Induced), Plantar Fasciitis, Arch and Heel Pain, Swollen Ankles and all other nerve and foot related conditions.